"Lets make magick by the light of the Moon." The New Moon always rises at sunrise. The Full Moon always rises at sunset. The Dark of the moon is the time when the moon appears to be completely covered in darkness. This is a time of the Crone, the Dark Goddess Hecate and a time to banish negative energies from our lives. We gather together during the Dark Moon Esbat to honour and understand the darker mysteries of the Goddess. We accept that we do not know all the answers and that those things we need to learn will be revealed in time. The Dark of the Moon is also a good time for scrying and other methods of divination. 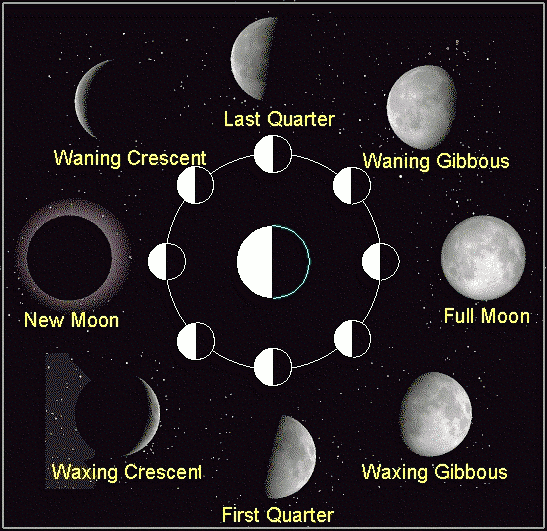 The time of the New Moon (the first two or three days the new crescent is visible) is a good time for celebrating new beginnings or doing magick, which involves growth (starting a diet, beginning a new course of study, etc.). Here the first light in the cycle of the moon begins and the Goddess is in her phase as a very young maiden ready to explore the new world. As the Moon grows in light, the energies of growth come with her. The day of the Full Moon and the day or two just before the calendar day of the Full Moon are the best times for doing magick for bringing something to you (a new job, prosperity, good luck, etc.). During this time, we recognize the Goddess as the young maiden who searches for a partner with which she can become a new mother. The maiden is full of fresh energy and is anxious to sing and dance throughout the world. The First Quarter Moon means that the Moon is waxing (increasing in light) and is 50% to 75% illuminated. The First Quarter Moon rises around noon and sets around midnight and she can often be seen during the daylight hours in the afternoon. The Goddess associated with the First Quarter Moon is the Goddess Anunit. The Moon is now brilliantly lit and growing quickly casting her light with strength, confidence and success. At New Moon the spells that we cast were in their infancy stage, but now magick has gained momentum along with the Moon. Our plans are solidifying and our inner visions are beginning to manifest in the physical plane. First Quarter Moon energy brings forth excitement and enthusiasm; we are shining brightly like the Moon, but still have a long way to go. We may still be facing challenges, but they tend to stimulate and excite us. This phase is often called the "crisis of action" because now is the time to move forward, build momentum and take action. We feel that success is within our grasp, but our goal has not yet been achieved. Now is not the time to rest on our laurels, there is still work to be done before fruition at Full Moon. Your attention is still required to keep your goal moving in the right direction or your goal may slip away without you realizing it. First Quarter Moon brings high energy and is an excellent time for planning, making decisions and organizing your life so that you can become more efficient and productive. Now is a good time to take on difficult or challenging projects that you have been putting off. It's also a good time to begin health or exercise programs, and to change your routine to get you on track and moving toward your goals. If you have confidence and self-esteem issues, the First Quarter is an excellent time to work on them. Remember that others are also feeling the dynamic energy of the First Quarter, so be aware that their energy will also be assertive, confident and decisive. Try to avoid conflict with others unless you wish to have a confrontation. Don't interfere with the progress of others and don't allow others to interfere in yours either. The Waxing Gibbous Moon appears to be pregnant, the Moon is perfectly round on the right side, but bulged out past half-way on the left. The Waxing Gibbous Moon contains and is gestating your hopes, dreams, wishes, and magick, until they are born at Full Moon. The Waxing Gibbous Moon rises at mid-afternoon and sets at about three am. The most auspicious time for magick spells during this Moon phase is at 10 or 11 at night. Call upon night Goddesses such as Nuit or Star Goddesses to aid you in your workings. During the phase of the Gibbous Waxing Moon you can continue to do waxing, drawing, increasing, or growth spells. The efforts made towards your goals at New Moon are brought to light. Moon energy is very strong as she moves towards the height of her strength at Full Moon. If your personal energies are low you can harness the Moon's energy to increase your magickal power and confidence. Growth may appear fast-paced and challenges or changes may occur. It is a good time to practice patience, and prepare for the Full Moon energies. It is also time to tie off loose ends. The Waxing Gibbous Moon can also be a time of gestation. It may appear as if action has paused, but it is still growing deep within the body of your magick. The Waning Moon, especially the days just before the Dark of the Moon, are best for doing magick for removing something from your life (bad habits, stress, etc.) or for clearing out negative energies. This is the time when the moon’s energy is becoming weaker and the strength of the light of the Goddess is diminishing. This is a time of great wisdom for She has learned much in her journey from infant to wise crone and it is a time to learn from this wisdom by going within and communicating with Her. This is a time of personal reflection and inner guidance. Soon the light of the Goddess will fade completely before the cycle will begin again. The full moon is when the moon’s energy is at its peak. The Full Moon is the best time for consecrating tools, charging jewelry, working magick to bring something to you, and for raising energy for the Earth or other Healing. It is also traditionally the time when Wicca’s gather to celebrate the power of the moon through an Esbat ceremony. It is during this time that the Goddess becomes the strong mother figure who cares for the earth and all its creatures. This is truly a joyous time for celebration. Most Wicca’s celebrate the full moon with a special ritual called the Esbat. We give each moon a special name. This is a month for thinking about the new year and forming plans and ideas to put into action during the coming months. Now is the time of endurance, death and rebirth. The Earth tides will soon turn towards the Sun, but for now we are still in darkness. Within the dark we may begin the personal alchemy of transformation. It is a time to strengthen our spiritual paths through contemplation and meditation. We shall remember our friends and family and many of us will reach out to the lonely and the needy through volunteering. The month of January is a good time for beginnings and conceiving. Work spells for protection and reversing magick. Your energy levels are low during this month, and much is going on below the surface. It is a good time to work on personal problems that involve no one else. The Full Moon in March is a time of exploration, growth and prosperity. Work magick for prosperity, luck and freedom from bad habits and/or oppression. March is also a time of balance between the Light and Dark, spells and meditations that work to break illusions so that you may see and accept the truth in your life are appropriate. The Full Moon in April is a time of creating, producing, and restoring balance. Work magick for change, self-confidence, and self-reliance. Spells and meditations that work to control temper and selfishness are appropriate. The Full Moon in May is a time of full energy for creation and propagation with power flowing from the Greenwood Gods and trees. It is a time when intuition and contact with Faeries and spirits is strong. Work magick to strengthen your connection to spirit helpers and protectors. The Full Moon in June is a time of full but restful energy that may be used for protection, prevention and strengthening. Meditations and divinations involving decision making and taking responsibility for what is happening in the present are appropriate. It is a time of Light, when the Earth tides are turning. Work magick to strengthen your positive traits and to discover personal inconsistencies. The Full Moon in July is a time of relaxed energy; it is also a time to prepare spiritually and physically for the coming autumn. It is a time to bask in your success. Dream-work, divination, and meditation on goals and plans, especially spiritual ones, are appropriate for this Full Moon. The Full Moon in August is a time when our energy is poured into harvesting, gathering and appreciating. It is a time to of vitality, health and friendships. Dream-work, divination, and meditation on the harvest we are receiving, and the seeds that we have sown, are appropriate for this Full Moon. The month of October brings us the Blood Moon. This Moon is also called the Harvest Moon, Shedding Moon, Winterfelleth, Windermanoth, Falling Leaf Moon, Ten Colds Moon, and Moon of the Changing Season. The Blood Moon falls just before Samhain and brings a change in energy that invites us to begin to draw within ourselves, to begin the long contemplative months of the coming winter. The October Blood Moon takes it's name from the ancient custom of killing livestock before winter arrives. It is a time of letting go of that which no longer serves you. It is a powerful time for meditations of Karma and reincarnation, inner cleansing and inner harmony. Magick workings about justice and balance are particularly relevant during the Blood Moon. The Blood Moon is a good time to purify your home, to remove unwanted energies or entities. If you're having bad luck, little accidents or feeling uneasy in your home, then the chances are good that that you need to thoroughly cleanse your house. The Full Moon in November is a time of grounding, preparation and transformation. Work magick that will strengthen your communication with the Goddess or God that seems closest to you.